It is generally assumed that the Royal Academy self-portrait was that which Gainsborough was painting for his friend Karl Abel, who died in 1787 before it was completed. In 1788 Gainsborough directed that no plaster cast, model, or likeness whatever of himself be taken after his death, but he allowed that ‘if Mr Sharp, who engraved Mr Hunter’s Print [see NPG 77], should chuse to make a print from the ¾ sketch which I intended for Mr Abel painted by myself, I give free consent’. William Sharp did not engrave the portrait, and Bartolozzi’s print may lack the presence Gainsborough anticipated. 1) Illus. Gainsborough’s Family, Sudbury, 1988, p 75. 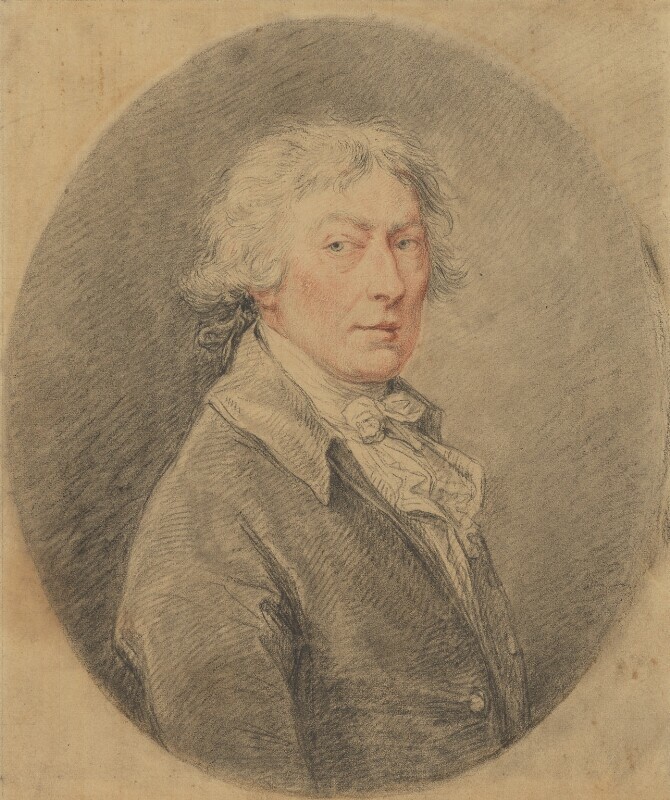 2) Unaddressed letter of 15 June 1788 (J. Hayes ed., Gainsborough Letters, 2001, p 175), and see Joseph Farington, Diary, 29 January 1799, when Gainsborough’s daughter recalled her father forbidding any cast or drawing of his face after his death, and directing that ‘no engraving should be made unless by Sharp who engraved the portrait of John Hunter and that He might but only from a picture painted by himself, in the possession of Mr Abel [sic], the musician, his particular friend’. 1 Crozier offered the drawing for sale in his capacity as an executor; he subsequently mentioned ‘the ladies interested in the sale’ (letters of 16 and 28 October 1897; NPG archive).